Everyone and their mother has suggestions on different workouts you should try, but it’s often a lot harder to get good advice on what warm up exercises you should do first, isn’t it? That’s the problem this article is going to solve. I’m going to show you how to properly warm up for exercise. As a general rule, you should kick off your warm up exercises with some light cardio activity. That can be anything from jumping jacks to jogging around, or anything that gets your heart rate going. Once you’ve done that for about five minutes, you want to switch over to some dynamic exercises to mobilize and get your joints lubricated and ready for the upcoming workout. Those are some basic fitness tips for you, but let’s get down to specifics. Let’s get started with one of the best warm up exercises of all time. It’s called the good, old inchworm. It’s essentially the same thing as a vinyasa flow from yoga. You’re going to lower yourself into a downward dog position and walk your feet in slowly towards your hands, and then walk your hands forward. Do this 10 times. It’s going to really open up the tight parts of your body, especially along your back. If you’re tight for space, just reverse the move and do it back and forth. However you do it, it will be great for you. This next dynamic warm up exercise is a leg swing to open up your hips. Position yourself with a wall next to your right side, stabilizing yourself with your right hand. You’re essentially going to kick your right leg from back to front—as if kicking a football—while swinging your left arm in unison. Do this about ten times then turn around, and repeat the move with your left leg and your right arm. Do a set of each once more, only this time, do it with your torso slightly turned to face the wall. This is really going to get your hips and your groin opened up. We’re now going to move onto a combination of a frog walk and pigeon stretch. 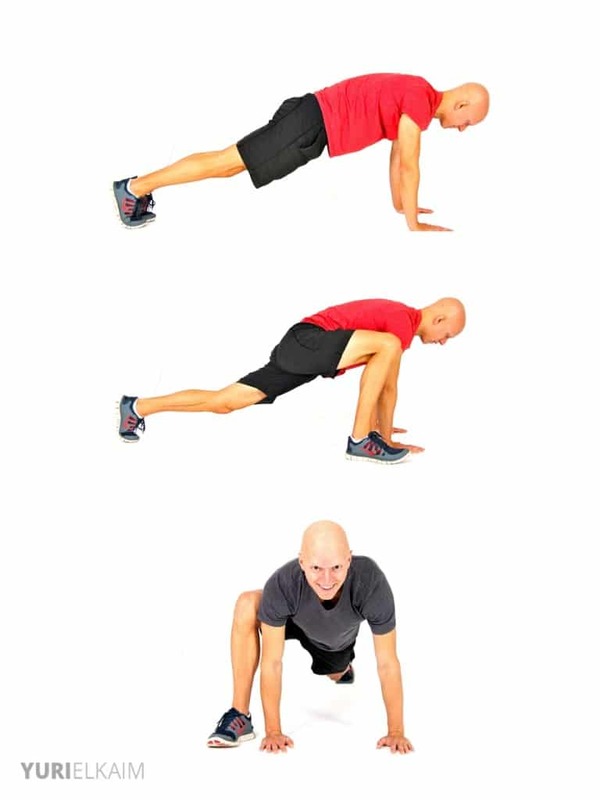 Get down into a raised push-up position. Start by bringing your right foot forward and placing your foot on the outside of your right hand. You’ve just done the first step of a frog walk. Step it back, now do the same thing with your left foot. A pigeon stretch is pretty similar, only it requires you to swing your left knee to your left hand and back, and vice versa. Alternate the two moves about 10 times each, and you’ll have given yourself a nice little stretching warm up exercise. 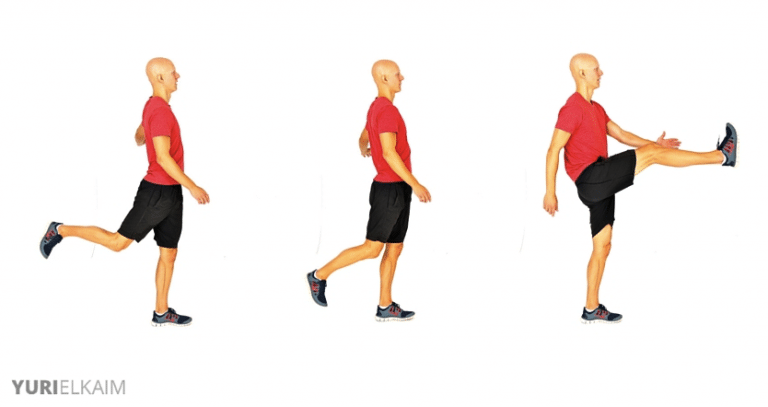 The fourth exercise is a reverse lunge with a twist. Stand up tall with your core engaged, then lunge backwards with your left leg. Next, gently twist over and back to the right over your right leg. Repeat this sequence on the other side. Finally, you’re going to do a cool upper-body nerve-flossing warm up exercise that my good friend Dr. Eric Cobb from Z-Health showed me. I love this move because it really helped me overcome a debilitating shoulder injury that prevented me from playing tennis for a while. Stand up straight with your core engaged. Stretch your right arm straight downward and flatten your palm as if you were pressing it against a dining table. Turn your wrist so that your palm is facing out to the side, then lift your arm so that it’s pointing out at a 45 degree angle from your body. You should already feel the relieving stretch in this deceptively simple warm up exercise. Take it a bit further by leaning your head gently to the left so that you’re stretching from your palm, right up through your arm, shoulder and neck. From here, you can even add a slight shoulder pump to increase the stretch, or flex your forearm forward. 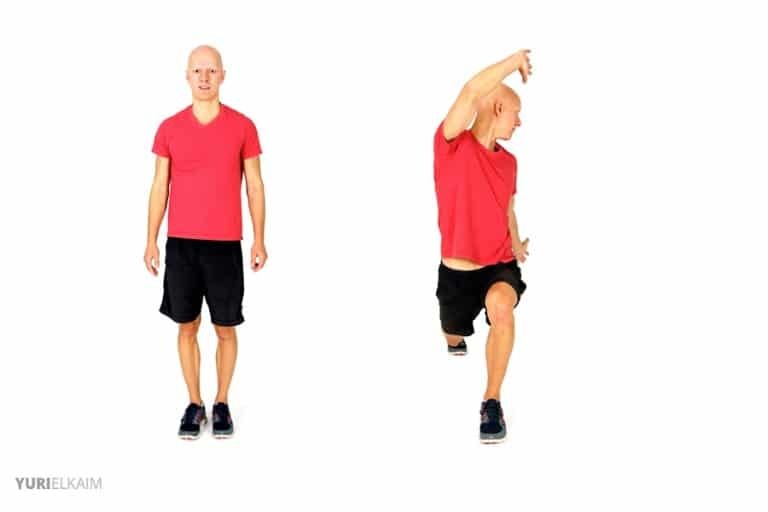 There you have it: five warm up exercises that will really help you open up your joints and get them nice and mobile before you begin your full workout. Give these a shot and let me know how they work for you.